On 23 September, more than 350 athletes from around the world arrived at the starting line for the inaugural Patagonia International Marathon. 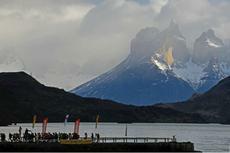 They ran through Torres del Paine, Patagonia’s most visited national park. Participants came from countries as diverse as Brazil, the United States, Germany and Uganda. Some were familiar with Patagonia’s rugged terrain, such as Omar Aguilar, who broke the Chilean speed record in 1988 and went on to complete the Rotterdam marathon in 2:12:19. For others, such as legend Stefaan Engels, the event marked their first visit. Engels earned the nickname “Marathon Man” after completing 365 marathons in one year. The runners participated in three categories: a full marathon (26.2 miles), a half-marathon (13.1 miles) and a 10K. The overall mission of the event was to promote conservation in Chilean Patagonia. Partnering with the Reforestemos Patagonia campaign, race organizers set a goal to donate 2,000 trees through donations of $4.00 per tree. Each tree was geotagged so that donors could find the location and a special website was set up to track progress. The event also included a donation option to Huemul Conservation, an organization that raises funds to help scientists study the Huemul population, a type of endangered deer found only in a few areas of Chile. A run through the rugged terrain of Patagonia was certainly difficult, but the event wasn’t all roughing it. At the end of the race, runners were treated to a Chilean barbeque with Patagonian lamb, and race packages allowed runners to stay in sweet digs like the Hotel Las Torres, located right at the finish line.